Joni, Trina, Deb and Eden. Best friends since the first day of school. Best friends, they liked to say, forever. But now they are in their thirties and real life - husbands, children, work - has got in the way. So, resurrecting their annual trip away, Joni has an idea, something to help them reconnect. Each woman will write an anonymous letter, sharing with their friends the things that are really going on in their lives. But as the confessions come tumbling out, Joni starts to feel the certainty of their decades-long friendships slip from her fingers. Anger. Accusations. Desires. Deceit. And then she finds another letter. One that was never supposed to be read. A fifth letter. Containing a secret so big that its writer had tried to destroy it. And now Joni is starting to wonder, did she ever really know her friends at all? When a group of four girlfriends go away for the weekend on their annual trip and decided to share secrets surely its meant to bring them closer together? Maybe not, whena fifth letter is found, one confessing alot of dark thoughts - a letter that makes everyone doubt their already strained friendship from the previous confession it really is a battle - was their friendship real to start with? As each friend hears their secrets read out, and hears the others thoughts on it, it really isnt the great idea it was supposed to be. This is a novel of anger, desire, deciept and friendship. Its full of twists and turns and leaves you guessing who wrote what. Nicola spends alot of time builidng each character allowing the reader to be able to form their own opinions. It took me a while to rememeber who was who, but that is often the case for me when thier is a group of more than 3 people that are key to the novel. So i slowed it down and spent time learning about them too. 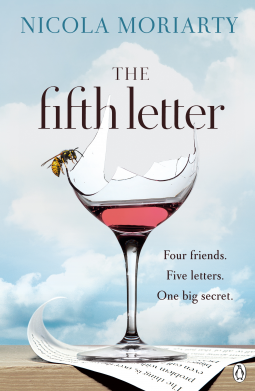 I really did enjoy this book, it was a strong read and really did keep my attention, and i didnt want to put it down, because i mean - i had to know who wrote the fifth letter, who had those thoughts, what would it mean for the women? Nicola Moriarty lives in Sydney's north west with her husband and two small (but remarkably strong willed) daughters. She is the younger sister of bestselling authors Liane Moriarty and Jaclyn Moriarty. In between various career changes, becoming a mum and studying at Macquarie University, she began to write. Now, she can't seem to stop.